PHOTO CAPTIONS: 1. The welcome sign to Las Vegas, 2. 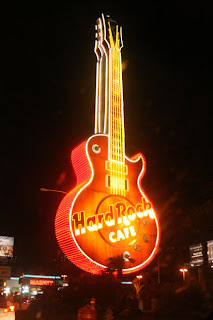 Hard Rock Cafe, 3. 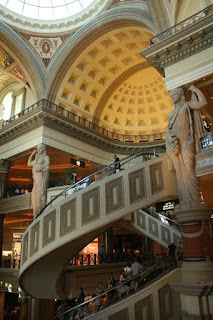 Cesar's Palace, 4. Elton, Bette and Cher never age, 5. Paris, France casino, 6. the Obelisk at Luxor, 7. 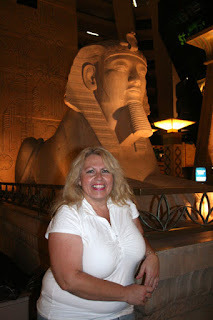 Debbie and the Sphinx, 8. Debbie and me at the Mandalay, 9. Daniel boxing with Joe Lewis, 10. The Excalibur, 11. Andre at Cesar's Palace, 12. The closest we got to a chapel, 13. Las Vegas style, 14. 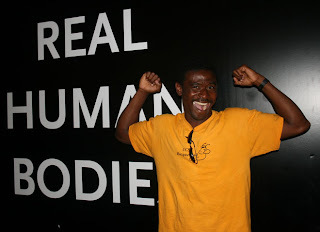 Andre shows off his Real Human Body, 15. Daniel interviewing for a new housecleaner, 16. No, we didn't buy a timeshare, 17. Visiting Lety's brother's family, 18. 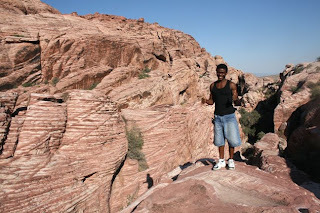 Andre at Red Rock Canyon. Originally, we'd planned to go to Kauai for Maya's birthday on June 17. But by the time Andre finally got his visa and arrived in the U.S. on May 25, the price of airline tickets had soared out of reach. That's when we decided to celebrate at Sea World instead. So I traded the timeshare in Kauai for one in Las Vegas. 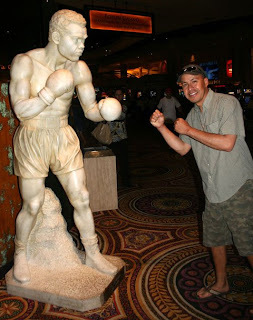 The last time I was in Las Vegas in the summer I swore never again. Lety's brother and his family live there, so Maya and I had been several times even though I hate the heat. 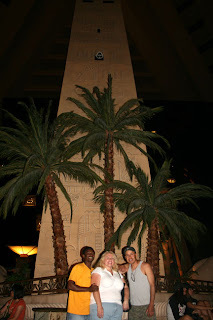 When I called the timeshare exchange company, they had very little available for summer within driving distance, and figuring that Las Vegas is something you have to see once in your life, I took it. Daniel had time off for 4th of July, and our friend Debbie had never been to Vegas, so the four of us decided to take on the adventure. I was surprised how well Andre handled the 8-1/2 hour drive. He recognized Highway 101 from our trip to San Diego, but we cut off in Paso Robles and headed east, into the dry, hot desert land. Andre had never seen anything like it. He guessed that they film cowboy movies out there. Our timeshare was surprisingly nice, a large one-bedroom suite with a pool downstairs. 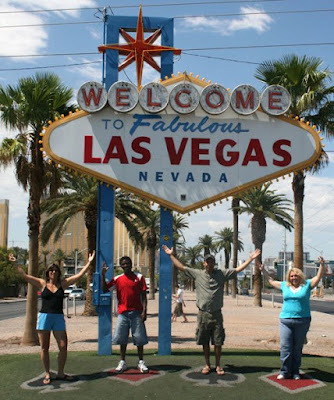 It's located on Las Vegas Blvd, but miles south of the big casinos on "The Strip," so it's lucky we had the car. According to the timeshare sellers at Tahiti Village, where we sat through a sales presentation in exchange for a deep discount on Cirque du Soleil tickets, we were told that the Mandalay was all by itself when it was first built, and now it's surrounded by the Excalibur, New York, New York, the MGM, etc. 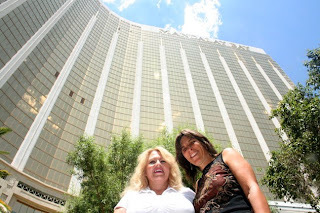 We were quoted $60 million per acre on the Strip, and watched videos of demolition of huge hotels which were later replaced by even bigger ones. Every time I go to Las Vegas I can't recognize it. 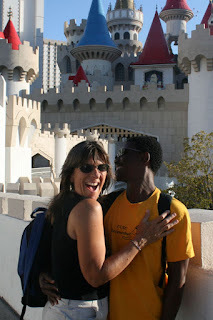 Mostly we walked through the casinos -- without gambling -- and looked for free entertainment. The others took advantage of the extravagant buffets, but I didn't feel like stuffing myself, which I always do at buffets. 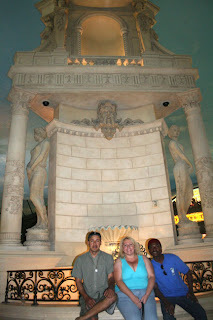 We watched the statues come to life in Cesar's Palace, the water show (http://www.metacafe.com/watch/4919/belagios_water_show_in_las_vegas/) and flower gardens at Belagio's, strolled through air-conditioned Paris and art-deco-era New York. The temperature got up to 108 degrees and cooled down to 92 at night. But it's dry heat. That's what they always say so you don't go into shock thinking about it. We took advantage of the pool, even late at night. Getting into the car, you had to be careful not to touch anything metal, like your seat belt, otherwise you could get burnt. Mostly we looked for AC. I treated all of us to the Mama Mia show on Saturday night, which was a huge success. We left the theater humming Abba tunes. Andre and I arrived late to our Cirque du Soleil show, because we spent so long at Red Rock Canyon, looking for the place that Maya played with her cousins and Lety's brother's kids. 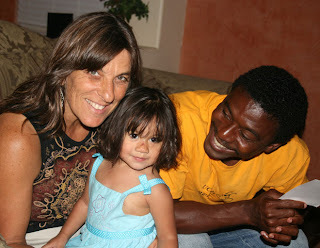 During spring break 2005, Maya rode out to Vegas with Moy and Lety and the kids a few days ahead of me. So this was my first time at Red Rock. I scattered some of her ashes there. But the loop through the park is 12 miles long and only one-way, so it took us a lot longer to get back to the Strip for our show than I thought. At least we only paid $20 each instead of $80 (due to the timeshare presentation we sat through). It was the first time for both us to see Cirque and we left hungry for more. Daniel and Debbie went to a concert by Beatles impersonators that evening. The four of us visited with Lety's brother's family. 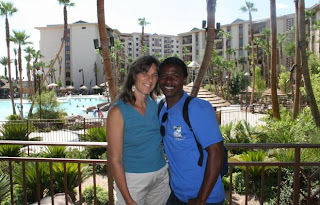 Moises (yes, same name as Lety's husband, Daniel's brother) arrived in Las Vegas in the late 1980s. Now he owns two homes and is trying to buy something else while the prices are so low. He and his wife Candy have four kids. I'd never met their little surprise, Gisel. She sported a cut on her nose from falling on the 4th of July when the family went out to a dry lake to send off fireworks. The drive back to Santa Cruz was long and uneventful. We got home late at night and I was thrilled to feel the cool night air and wake to fog the next day.